The global industrial control for process manufacturing market is brimming with competition, observes Transparency Market Research (TMR). The top four players, Schneider Electric, Siemens AG, ABB Ltd., and Emerson Electric Co., together accounted for a share of 48% in the global market for industrial control for process manufacturing. The consolidated nature of the competitive landscape paves the way for increasing technological advancement via extensive research and development initiatives. The most prominent growth strategies of the leading companies are mergers and acquisitions. The global industrial control for process manufacturing is advancing at a steady CAGR of 5.2% between 2015 and 2021. The market is expected to reach US$96.20 bn by 2021, promising considerable opportunities for growth. Based on end user, the global industrial control for process manufacturing was led by distributed control systems (DCS). The DCS segment is expected to keep expanding at a CAGR of 4.7% during the forecast period 2015-2021. The rising demand for distributed control systems can be attributed to their ability of controlling production lines over a plethora of industrial applications. By geography, the Americas held the largest share of 35% in the global industrial control for process manufacturing market in 2014. Upgrading initiatives as well as the booming oil and gas industry have been responsible for the incomparable growth of this region. Asia Pacific presents vast growth opportunities, supported by numerous smart grid projects in the region. The growing need for ensuring uniformity across manufactured products in innumerable industry verticals is one of the key growth drivers of the global industrial control for process manufacturing market. Various industries such as textiles, healthcare, chemicals, food and beverage, power, oil and gas have been increasingly acknowledging the potential of industrial control for process manufacturing, and therefore displaying great demand for the same. Industrial control for process manufacturing is capable of ensuring safety across complex manufacturing operations. The high rate of manufacturing processes undertaken by industrial nations including China and India are offering much scope for the expansion of the market. As these systems are apt at preventing defects and failures in the manufacturing processes, increasing number of end users are likely to adopt them over the next few years, propelling the global industrial control for process manufacturing market. The growing number of oil and gas projects in Asia Pacific are likely to boost the growth of the market further. The supervisory control and data acquisition systems in particular are witnessing tremendous demand in the region. Latin America and the Middle East are also slated for substantial growth, contributing significantly to the expansion of the global supervisory control and data acquisition market. On the flipside, the expansion of the market might face obstructions due to the impending saturation of the industrial control for process manufacturing market in Europe as well as North America. This is because these regions no longer feel the need to invest in industrial control for process manufacturing. 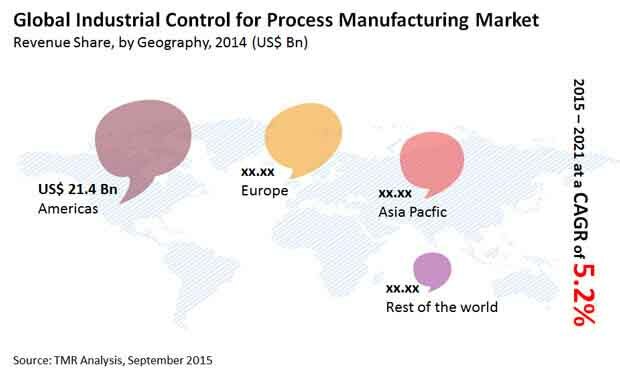 However, the global industrial control for process manufacturing market is likely to overcome the negative impact of these inhibitors owing to the continual emergence of new technologies such as distributed control systems, manufacturing execution systems, supervisory control and data acquisition, and programmable logic. The information presented in this review is based on a Transparency Market Research report, titled, “Industrial Control For Process Manufacturing Market (Technology- Supervisory Control & Data Acquisition (SCADA), Programmable Logic Controller (PLC), Manufacturing Execution Systems (MES), and Distributed Control Systems (DCS); and Application (Chemicals, Healthcare, Oil & Gas, Food & Beverages, Power, and Textiles)- Global Industry Analysis, Size, Share, Growth, Trends and Forecast 2015 - 2021”.